Hi all, it’s been a while. With this new release I ported away Minitube from Phonon, a multimedia API that originated long time ago in the KDE project. I evaluated both QtAV and MPV, wrote my own media abstraction around them and finally chose to ship with libmpv. It’s a great open-source project and very active. Kudos to them. As a direct consequence to using a new multimedia backend, Minitube now supports all YouTube video resolutions up to 4K. In Mac land, I added support for the new Dark Mode that was introduced in macOS Mojave. Switching on fly is also supported. Minitube 3.0 ships with the brand new Qt 5.12.2 which brings many improvements and fixes some UI bugs. Enjoy your trusty and up-to-date Minitube! Just a quick note to announce the release of Minitube 2.8. In this released I focused on improving the overall quality of the application by fixing small bugs and defects. Enjoy! PS. Tomorrow I’m leaving for my usual mountain camping in Abruzzo, only leave kind comments! Hi all, a new Minitube version is ready. This time I focused on a number visual style improvements. The main toolbar with the media controls is only shown when viewing videos and doesn’t clutter other views. On macOS I fixed an annoying bug with sidebar resizing. On Windows and Linux the menu bar can now be hidden by pressing ALT. On Linux I dropped custom styling for sliders, icons and the tab bar so Minitube will closely follow your system theme. Also the fullscreen experience is improved with overlay toolbar and sidebar that do not cause the video to resize. This release is about porting Minitube to the new YouTube APIs, version 3. The old ones are going to be switched off in a few weeks so everybody make sure to update. Minitube is now using HTTPS everywhere for better privacy and security. Also, Minitube now loads 50 results instead of 10 so finding the right video now requires even less clicking. The Windows and Mac version ship with LibVLC 2.2.0. This should solve playback issues reported by a few Windows users. On Ubuntu, the “Ambiance” style toolbar is now back. Minitube sources moved to GitHub. YouTube API version 3 requires an API key. Each key has a limited “quota”. In order to build you need your own API key. Check the README.md file for details. Hi all, this release brings many under-the-hood changes. The biggest one is the switch from QuickTime to VLC as the multimedia engine on the Mac. Windows users also get a major update to the VLC libraries used which should solve many reported issues. The switch to a newer VLC also brings much better and reliable video seeking and faster video start, especially with longer ones. 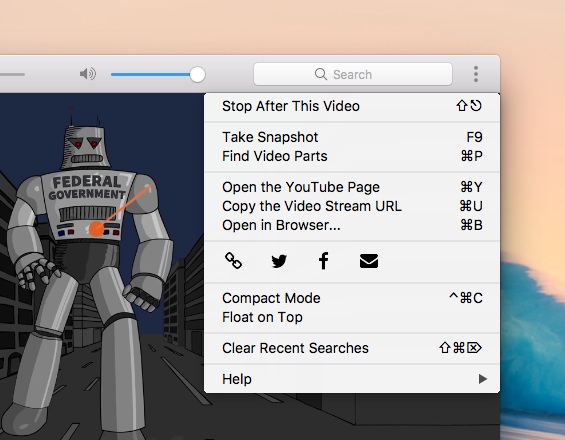 Feature-wise, Minitube can now create video snapshots (i.e capture frames) at full resolution just by pressing a key. Bloggers and social media users will probably put this feature to good use. The search suggestions that popup while you type received some usability and style enhancements. 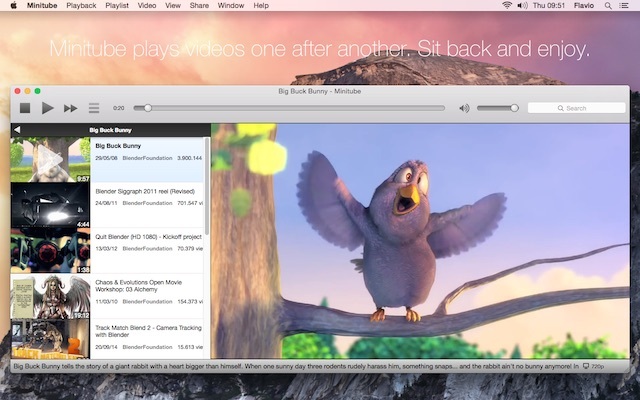 Minitube now supports Mac OS X Yosemite (10.10) and works again on Snow Leopard (10.6). On the Linux side, I decided to stop publishing Minitube via the Ubuntu Software Center: updates were approved too slowly and getting feedback was always hard. Starting from this release, I’ll take care of .deb packages directly on this site. The Ubuntu & Debian version is now shipped as a .deb on the site. Goodbye Ubuntu Software Center!